Hurricane Harvey was the costliest tropical cyclone on record, inflicting nearly $200 billion in damage, primarily from widespread flooding in the Houston metropolitan area, breaking the previous record set by Hurricane Katrina. The USSAAC AAC Disaster Relief Committee responded. We learned that Elena home schools her children, Alissa (age 12) and Andrey (age 10), who have autism with limited speech. They were using iPAD minis with Proloquo2Go and the Ava Talker apps and lost their devices as a result of the aftermath of the hurricane. When I spoke to Elena I learned she had prepared…she had backed up their devices on the Cloud. [YOU CAN’T PREDICT BUT YOU CAN PREPARE]. So, even though her children’s devices were lost, their vocabulary and set up was available. On October 15 we prepared and submitted a request to the Red Cross to replace both iPAD minis. The request was approved within days and two iPAD minis were shipped directly to Elena at their temporary ‘home’ in a hotel in Dallas. Liz Begley, an SLP and AAC Disaster Relief committee member from College Station in Texas, made sure each child got an appropriate Otter – Box case with their favorite football team logos (the Dallas Cowboys and UT Longhorns). Evan was 20 years old, living with his mom, Melissa Johnson, and two siblings. Evan and his brother have autism. When Hurricane Harvey ravaged Houston, Evan’s iPAD was damaged. 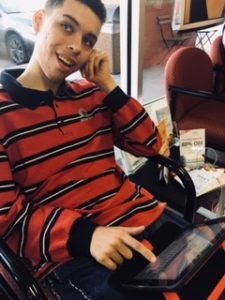 According to his mom and a speech-language pathologist, Lori Ann Seibel-Petrash, Evan requires access to assistive technology (I-Pad) with a special communication app Talk Tablet to communicate, especially under stress because when he can access it, behavioral issues are significantly reduced. On September 13, 2017, Melissa submitted a request for help to HarveyAAC.recovers.org, which began a series of exchanges between members of USSAAC’s AAC Disaster Relief Committee and ultimately led to Evan getting a replacement iPad with a protective case. Melissa was able to download his communication and other apps. USSAAC worked collaboratively with the Red Cross, who replaced the iPAD and sent it directly to Melissa. We also connected Melissa up with Easter Seals, the Texas Autism Society and encouraged her to also reach out to Family to Family.